KISSopolis: The Four-Who-Are-One Split Up For "KISS Solo"
The Four-Who-Are-One Split Up For "KISS Solo"
Celebrating 40 years of rocking out together in 2013, KISS is marking the occasion by returning to comic books this March with the miniseries "KISS Solo" from IDW Publishing. "KISS Solo" spans four issues, each chronicling a different member of the group on an individual adventure. 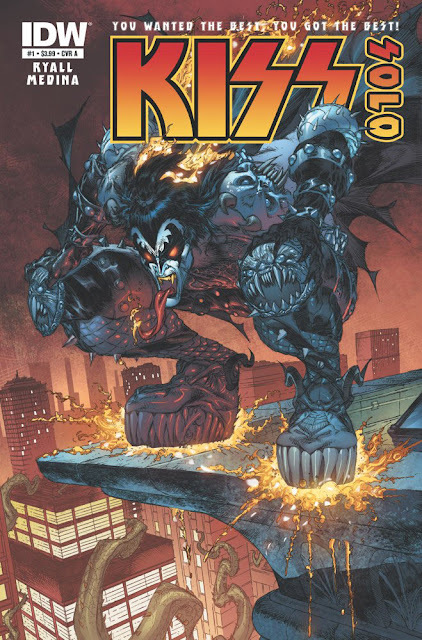 The first installment titled "KISS Solo #1: The Demon" stars Gene Simmons, better known to fans as The Demon. Writing this first issue of the miniseries is IDW Publishing editor-in-chief Chris Ryall, who has also penned "Zombies vs. Robots" and "Mars Attacks: KISS." Ryall is joined by artist Angel Medina on the issue. Tom Waltz, who co-writes IDW's ongoing "Teenage Mutant Ninja Turtles" title with Kevin Eastman, is writing the second issue of the miniseries, with the subtitle "The Starchild," with Tone Rodriguez on pencils. Ryall and Waltz spoke with CBR News about what to expect in their respective issues of "KISS Solo," their love of the franchise and Ryall's personal experience of geeking out with Simmons over comics.